KLF News: Pirates at Easter? 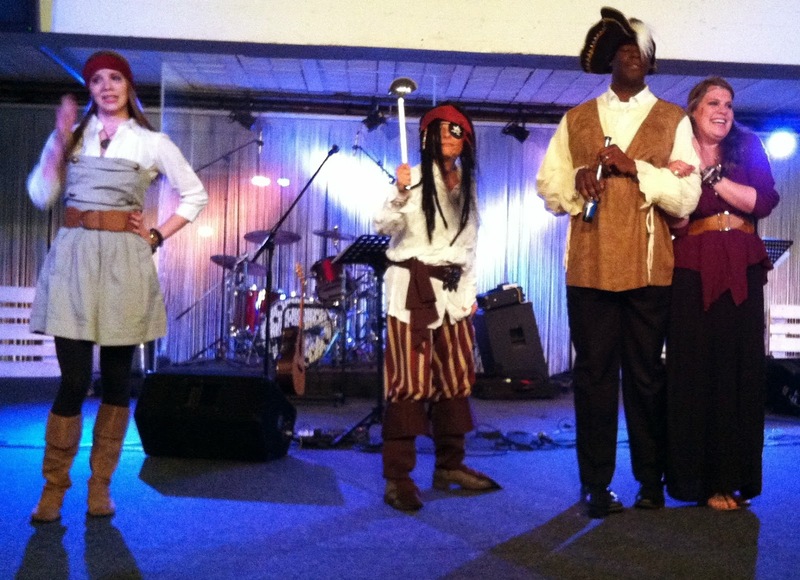 What do Pirates have to do with Easter? Not much, really, but when you have someone as creative as Natalie Blair and a crew of people who are gifted actors, you get a drama set on a pirate ship that tells the story of Christ's substitutionary death on behalf of sinners, taking the punishment they deserve. It was a wonderful parable that expressed the Gospel in a fun way. It was a joy to see our people use their gifts for God's glory! We praise God that Jesus is able to save us completely; spirit, soul and body and that He is a perfect High Priest who lives to intercede for us. Hallelujah! This week, Julius Regala, senior pastor of our church plant in Butuan (Philippines) will be visiting us for 2 weeks. As part of his visit he, along with Richard, will be leading 2 evenings of prayer and worship on the 2 and 3 May. He will also be spending time with the church, visiting our various small groups and being part of our church life. We are excited about the doors God has opened for us in Butuan and in the Philippines and that we can co-labour with Julius and his wife, Roszel, to build God's Kingdom there. As we continue to pray and fast as a church, we are expecting breakthrough this year to see God's Kingdom increasingly revealed and established in our lives and our cities. 02.05 and 03.05: Breakthrough! Two evenings of worship, teaching and prayer to breakthrough into the supernatural realm with Julius Regala (senior pastor of Kingdom Life Butuan, Philippines) and Richard Morschel (senior pastor of KLF) at KLF, Salzschlirferstr.15, Frankfurt. 10.05: Return to Glory - Kingdom Men Conference with Alexander Blair (leader and Life Coach at KLF) at the Seminarzentrum Rückersbach.